Yamilys Brito studied printmaking at the Instituto Superior de Arte in Havana. She graduated from the school in 1996 and currently teaches there. 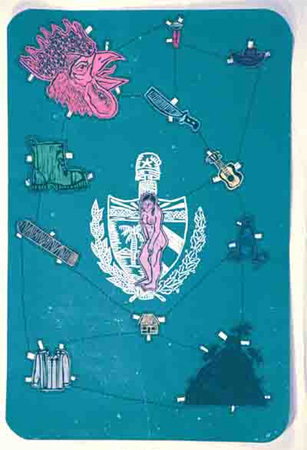 In her work, Brito often combines a number of printing techniques, both conventional and experimental. Her approach to subject or theme parallels this approach to media techniques. Whether the focus is Havanaa frequent theme in her workor identityas in the case of the series depicted abovethe distinct, iconic images that comprise each print resonate by virtue of Brito's meticulous selection, combination, and execution. Recent solo exhibitions include: Criticism vs Scapism, Galeria Robert Savedra, San Francisco, 2000; Mirrors and Windows, Galería La Acacia, Havana, 1998; and At the end of the Street, Centro Wifredo Lam, Havana, 1996. Recent group exhibitions include: Cuban Art, Port au Prince, Haiti, 2000; Cuba 2000, Paris, France.